Would you eat dinner at a place that also offers smog testing? I didn’t take a chance on the food while my car was getting its smog test. Instead I stood out in front and sketched. The car was finished and certified in 10 minutes—before I could finish painting. He looked at my sketch but still couldn’t really comprehend the concept that I was drawing his humble establishment. But he said, “Nice picture. Take your time.” And I did. And if you’re looking for a quick, easy smog check at the best price around, Smog Check Express in Richmond was great. 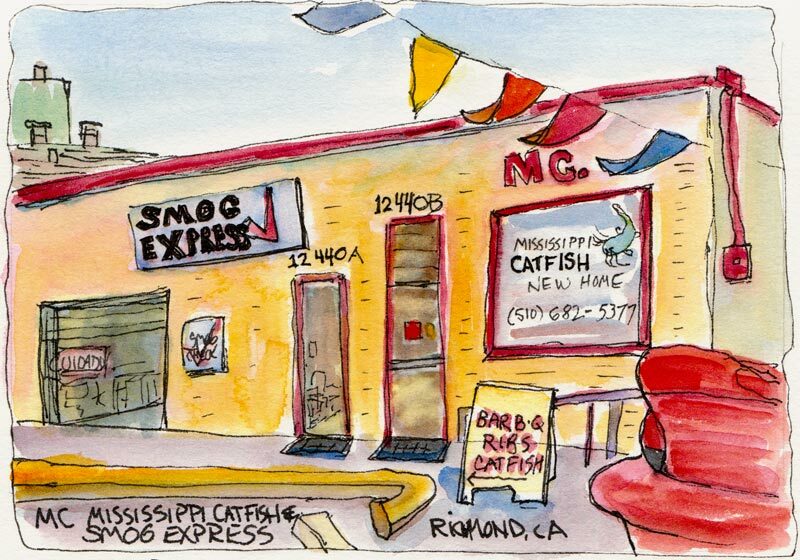 Love this, altho’ I am pretty sure I would have checked out the catfish. Funny, out of the way places often times have the greatest food! You are such fun. I can just picture that puzzled guy checking and rechecking. Hi Jana, I wonder how many people pass everyday and notice the odd juxtaposition of business establishments! Too funny! And wonderful composition! Funny post! I’ve noticed a trend to combine gas stations with eateries and I’ve always thought that strange too. Though, it does seem to always be busy! I love it! The painting and the business! Thanks. Lovely colors! The story made me chuckle, I am familiar with this lack of comprehension. You get that when sketching in public places, people don’t know what to make of us. Well, if the place got kicked all the way from Mississippi to California, there probably is something wrong. But service stations and the like are often excellent eateries in their line, in MS, where I come from. You can get the best barbecue in the world in a shack in Pocahontas, just north of the capital. In Oxford, Faulkner’s country, a 7-11 has fried pies to kill for. See also: Oh Brother, Where Art Thou?